In an attempt to reach out to more children, we will be opening a centralised kitchen in Bhilwara, Rajasthan. On March 29, 2017, Akshaya Patra signed a Memorandum of Understanding (MOU) with Rural Electrification Corporation Limited (RECL) to open a kitchen in Bhilwara. 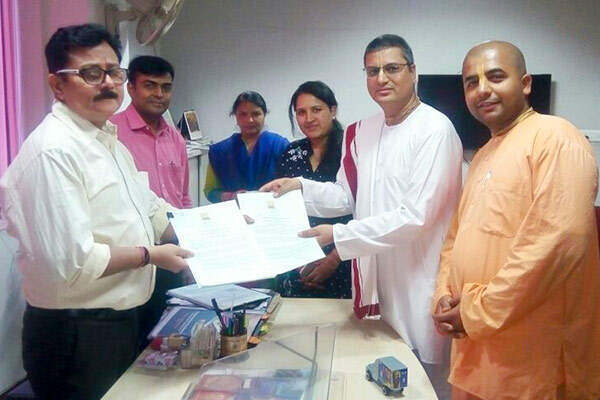 The MOU was signed in the presence of Mr Harsh Baweja, Chief Project Manager of RECL Jaipur; Shri Govind Dasa, President of Akshaya Patra Rajasthan; and Shri Raghupati Dasa, Programme Coordinator – Akshaya Patra Jaipur. RECL, one of the leading public sector enterprises administered by Ministry of Power, has undertaken this project in accordance with their Corporate Social Responsibility (CSR) policies and will be supporting the cost of the kitchen. In Rajasthan, we currently feed mid-day meals to over 1.7 lakh school children across five locations. With the new kitchen in Bhilwara, we will be expanding our reach with freshly cooked nutritious meals! As we move forward, we would like to thank RECL, the State Government of Rajasthan and the Government of India for their support towards Akshaya Patra’s Mid-Day Meal Programme.